Fashion is all about showing your true colors and unique personality. That being said, the office normally isn’t a place where you use fashion to make a statement. However, it seems as though that concept might be changing. A new trend has been growing that involves corporations and employees wearing unique custom branded socks with their employers logo on them. People in offices around the world are now using colorful and stylish socks as a means to express their individuality. The custom socks frenzy is officially here, and it’s easy to see why. Socks are a great way to add some style and color to an otherwise conservative outfit. They are useful, comfortable, fully customizable, which make them the ideal promotional product. Everyone can always use another pair of socks! A recent study revealed that on average people buy 12-14 pairs of socks every year. The sock industry is expected to grow 6.7% worldwide from 2018 to 2025 and will be worth an estimated $75.10 billion. Custom socks became one of the hottest promotional products in 2018 and that popularity is only expected to grow. Why do companies love promotional socks so much? Well, they generate up to 500% more referrals from satisfied customers than other promotional products. Businesses understand the power that a trending product can provide. The Discovery Channel recently partnered with Sock Fancy, a company that offers a subscription sock service, to create custom “Shark Week” socks in order to help promote the channel’s infamous week. Even startups are getting in on the fun. The young tech company IFTTT has their own standard issue neon argyle socks that help to differentiate their brand and welcome in new employees. It’s now quite common for customized colorful socks to pop up in meetings and board rooms around the business world. Younger workers are particularly fond of the trend. 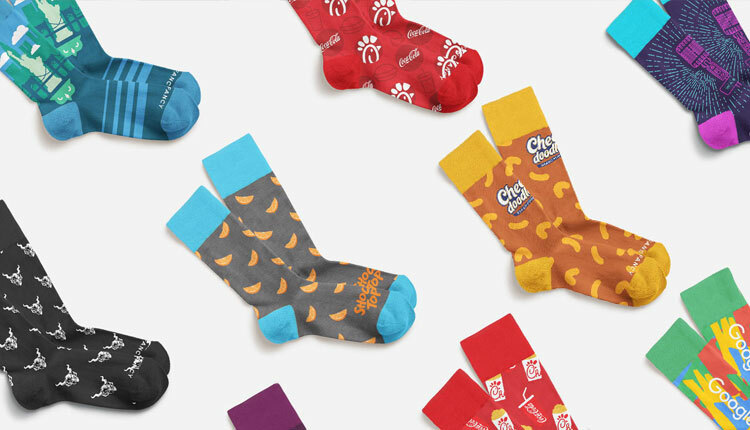 Companies have found that their sock campaigns really work because the giveaway is unusual and people connect to the brand in a fun and unique way. Nocking Point, a celebrity-owned winery with a huge market for merchandise, requested a unique item to add to their current offering. They were instantly enamored by the socks, placed a 1,000+ pair order and have since placed two re-orders because of the popularity of the socks among all their fans and fellow connoisseurs. As you can see, custom branded socks are the go-to promotional product. iPromo can help design the perfect custom socks to promote your brand and help your company stand out as the one-of-a-kind business that it is. Our selection of custom socks is expansive and provides a lot of different options for your next promotional marketing offering. Any color, design, logo, or message you can think of can put onto our socks. We’ve noticed that the most popular sock for creating custom promotional products is the full color crew with black heel sock. The length of these combined with their large space for customization make these a truly fantastic promotional product. There are a variety of different ways to use customized socks in order to increase brand awareness for your business. If your company deals with several corporate clients, you can use socks as a corporate gift to receive some extra publicity. Your clients will always be happy to receive a comfortable pair of socks sporting your logo. Every time they wear them, they will have a positive association with your company. Using socks as a gift to your employees can also help to increase their loyalty and encourage them to show off their pride for their company. Winter is a great time to give out custom socks, as the colder months are classic sock weather. Also, if your company has a sports team, you can use custom sport socks to increase team spirit and respect for the company. The applications for using customized socks as promotional products are seemingly endless. Now that you’re on board with the sock trend and understand the potential benefits associated with choosing socks as a promotional product offering, we’d like to remind you how simple the process of creating a custom sock with iPromo really is. We have a full service design team on staff that is standing by to help your dreams become a reality. Our sock designs provide endless opportunities for customization and creativity. Additionally, if you want to go with a simple and straightforward design, you can always put your logo on one of iPromo’s argyle style socks for some classy boardroom approved brand recognition. No matter what design you ultimately go with, you can rest assured that the process will be easy and that your socks wills be a big hit. You can really make an impact with your next promotional marketing campaign, and we would love to help that happen! If you would like to hear more about how iPromo can help create the perfect customized sock, please reach out to us today.